ENSENADA, Mexico—Las Vegas’ hall of fame desert racer Rob MacCachren’s quest to win his third straight SCORE Baja 1000 has clearly earned the spotlight for Sunday’s premier telecast of the 49th Annual SCORE Baja 1000 on the CBS Sports Network. The extended two-hour show, with multiple repeat airings scheduled, will debut on Christmas night (Sunday, Dec. 25) at 9 p.m. ET on the popular CBS Sports Spectacular show. Announcers for the CBS Sports Network telecast of the 49th SCORE Baja 1000 are Jared D’Anda, SCORE racer/TV action-sports announcer Cameron Steele and SCORE racer Bryce Menzies. Methodically mastering a radically rugged course and a celestial field of challengers, MacCachren rolled like a Rockstar, with an assist from co-driver Jason Voss, driving to the overall and SCORE Trophy Truck victory on Nov. 19 at the SCORE Baja 1000. The victory in the Granddaddy of All Desert Races gave the veteran MacCachren a rare three-peat in the world’s toughest, roughest, longest and most prestigious continuously-held desert race. MacCachren, with a big assist from co-driver Jason Voss, rocketed to a memorable race around the northern part of Mexico’s mysterious and majestic Baja California peninsula. The daring duo finished the mentally-draining, physically grueling, vehicle-destroying 854.50-mile race that started and finished in Ensenada in 17 hours, 12 minutes and 58 seconds while averaging a solid 49.63 miles per hour in the No. 11 Rockstar Energy MacCachren Motorsports Ford F-150. Racers from Mexico and Las Vegas finished second and third overall behind USA’s MacCachren/Voss duo. For the second straight year, Mexico’s Carlos ‘Apdaly’ Lopez of Tecate, just 21 who won last year’s SCORE Trophy Truck season point championship, finished second in the No. 1 RPM Racing Chevy Rally Truck splitting driving with his father Juan C. Lopez in a time of 17:39:45 with an average speed of 48.38 mph. Third overall and in SCORE Trophy Truck in the new No. 91 Monster Energy Terrible Herbst Motorsports Ford F-150 was Las Vegas’ Troy Herbst and Ryan Arciero, Foothill Ranch, Calif. in 17:42:10 at 48.27 mph. What originally was planned as a solo ride in the Pro Moto Unlimited class, went to a two-rider effort on Monday of race week, ended up with a five-team effort to help the injured rider of record Colton Udall, Yucca Valley, Calif. finish the 2016 SCORE World Desert Championship undefeated with four straight victories. With a whole lot of help from his friends after he was injured while pre-running three nights before the race, taking the overall and unlimited class win for the fourth time in the last five years in this race was the Ox Motorsports team led by Udall, Yucca Valley, Calif. Suffering a severely broken left collar bone while pre-running near Borrego Tuesday evening of race week, Udall quickly adjusted his rider list for his 1x Honda CRF450X, moving one rider from his Ox Motorsports 3x motorcycle and quickly recruited two additional riders to pick up the slack for his 1x team. Regular teammate Mark Samuels, Yucca Valley, Calif., added additional miles to his racing sections, Australia’s Daymon Stokie was moved from the 3x team to the 1x and Udall recruited two additional riders who weren’t planning on racing this year in Justin Jones, Murrieta, Calif. and David Kamo, Boise, Idaho. 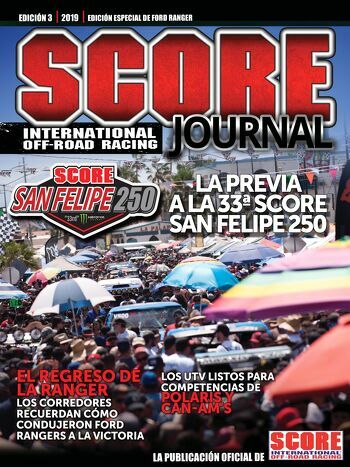 SCORE rules call for a rider of record to either start or finish a race, Udall wanted to win the race and the season point championship so he returned to Ensenada after surgery in San Diego to start the race and ride to the around first turn some 200 yards from the start to fulfill that requirement. All races in the four-race 2016 SCORE World Desert Championship, along with the special SEMA SCORE Baja 1000 Experience and qualifying for the SCORE Baja 1000 from Las Vegas Motor Speedway have once again been airing in the USA and Canada on the CBS Sports Network. The spectacular shows have featured not only SCORE Trophy Truck coverage, but also top action and highlights from many other classes of trucks, cars, UTVs, motorcycles and quads – making sure that the most exciting footage and most compelling stories continue as part of each race event broadcast. From award-winning documentary filmmaker Dana Brown, Dust2Glory has chronicled each of the four races in the 2016 SCORE World Desert Championship. D2G, which began shooting at last year’s SCORE Baja 1000, continued up close and personal coverage capturing the robust racers in their amazing adventures in Mexico’s majestic Baja California peninsula through all four spectacular 2016 races.